Renewable energy solutions are the way forward. Warm Front Limited offer a complete portfolio of renewable energy products, tailored to suit the needs of your property. Multiple solutions can be deployed on a single property and our team of experts can find the right solution for you. Solar PV systems capture the sun’s energy using photovoltaic cells. These cells don’t need direct sunlight to work, as they can still generate some electricity even on a cloudy day. The cells convert the sunlight into electricity, which can be used to run household appliances and lighting. This solution can not only reduce your household electricity bills, but can also earn you money using the Government Feed In Tariff scheme! For more information on the Feed In Tariff (FIT) please visit our page or the Government website. Solar PV can make the most of your roof, reduce your energy bills and help the environment whilst you benefit from the Feed In Tariff! What’s not to like? 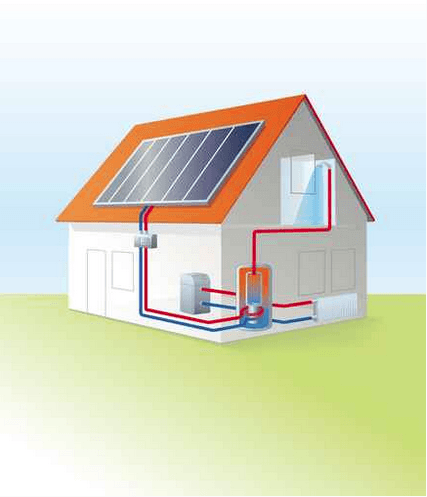 Similarly to Solar PV, Solar Thermal involves putting panels on your roof. 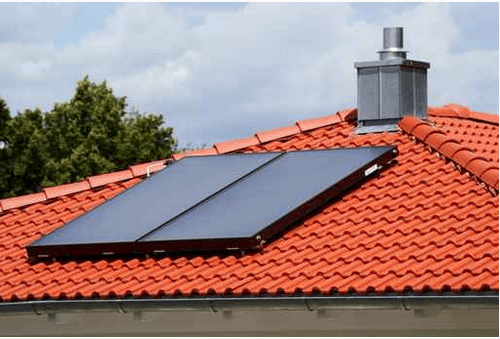 The difference between the two is that Solar Thermal panels convert the sunlight into heat which can then be used to supply you with hot water. Solar panels are fitted to your roof, the converted energy heats up your water and it is then stored in a hot water cylinder. A conventional boiler or immersion heater is used in connection with your solar thermal system to provide you with heating throughout the whole year. For the system to work, you need the same roof specifications as Solar PV. However Solar Thermal requires fewer panels, with it usually only needing between 1 and 2 square metres per person living in the house. Shade on the panels at any time of day will reduce the performance of your system. For more information, our friendly staff can talk you through all you need to know. Savings can be up to £125 per year (if you currently have a Liquefied Petroleum Gas (LPG)), or typically around £65 if you have a gas supplied property. If you are in an “Off Gas” property this means that you do not have a supply of gas coming into your home. “Off Gas” properties usually rely on Liquefied Petroleum Gas (LPG), Electricity or other means of heating. Air Source Heat Pumps (ASHP) can be a great solution for “Off Gas” homes. They act with a similar concept to a fridge, but in reverse. ASHP’s harvest the hot air from the outside of your property and transfer that heat energy into various systems in your home. This heat energy can be used in traditional radiator panels, under-floor heating systems, or even your hot water system. Like many renewable solutions, there is potential for earning an income as well as making savings on your energy bills! ASHP’s can benefit from a Government scheme called the Renewable Heat Incentive (RHI). For more information on the RHI scheme, please visit the government website. Please be aware that you will have to change your current tariff with your energy supplier to ensure that you reap the benefits. Warm Front Limited can provide you with all necessary information to help you through that process, giving you friendly and professional advice. 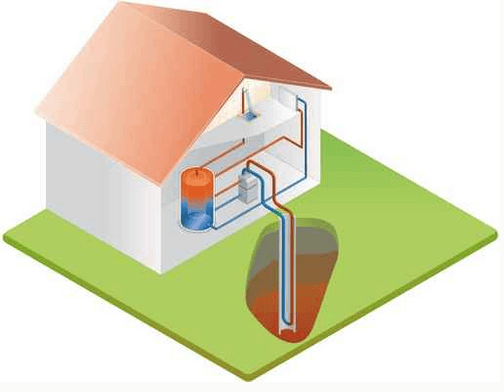 Ground Source Heat Pumps (GSHP) are another technology for providing heat into your property. It works by burying either a horizontal loop of pipes or a vertical bore hole loop of pipes into the ground next to your property. 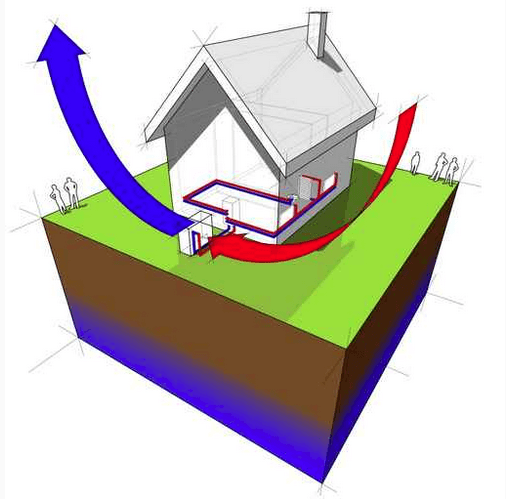 Heat is then harvested from the ground and transferred into your home. With typical systems lasting over 25 years, these are a long-term investment with a possible payback on investment after around 5 years, depending on your system. The savings can reach highs of around £1,045 a year if you are a current coal consumer. With the addition of the RHI scheme you could even receive up to £3,940 a year in addition. For more information on the RHI scheme, please visit the Government website.